Our workshops are a fun, fast paced way to learn how to bring your ideas to life! We offer a range of workshops to individuals and organizations. If you want to try something new with your officemates, want to get in the habit of making robots every day, or have an idea for an art project that involves technology but need some help - we'll have a workshop for you! Want to get out of the office and do something fun for a day or afternoon? Come to our bright, Sunny Soma workspace and create with us! We have workshops tailored for team "building", starting at $59/person. Some topics include: Desktop Robots, Interactive Art, Music Visualization, Seriously Silly Internet of Things, and InstaParty Lights. ​We can help you find the right workshop. We also can offer corporate versions of most of the workshops below. This fall - Course One "Party Revolution" - Six Session Intro to Creating. Youth and Adult options. Scheduling: We will be scheduling monthly workshops. Once you purchase one of our workshops, we will notify you when our next workshop is scheduled. If you are not able to make that workshop, we will continue to notify you of workshops as they are scheduled. We are also able to do group workshops, so if you have at least 5 other people/small groups that would like to take a workshop with you, contact us and we can schedule a workshop around your group's schedule. Group workshops can cover any of the workshops, plus we are happy to scope out a different topic for your group/event. We can accommodate larger groups as well. 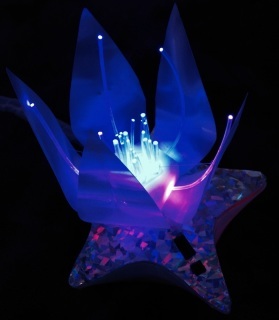 Ultraviolet fluorescent materials allow you to easily make something simple or detailed that glows vividly without directly involving wires and batteries to make it glow. This lower-tech option is great if you just want to express an idea in bright colors and multiple textures. 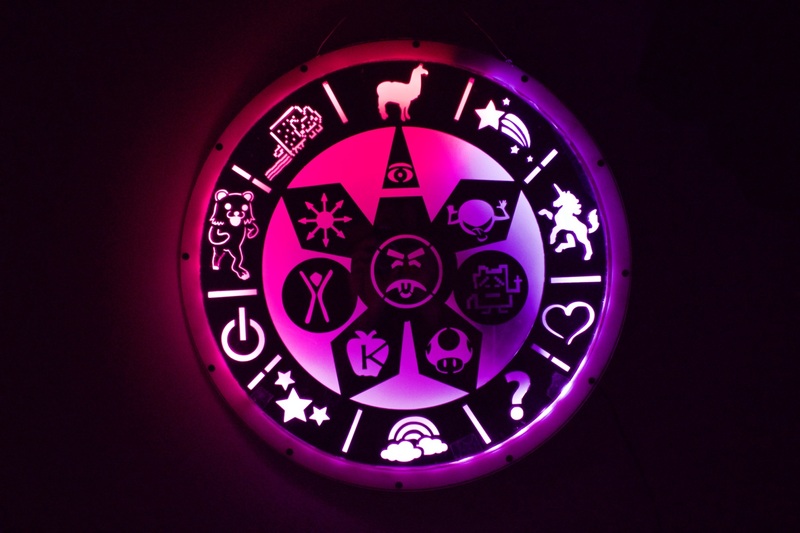 Perhaps you already have black light fixtures (LED or otherwise) or intend to build some. Develop a backdrop for an entire ultraviolet installation! 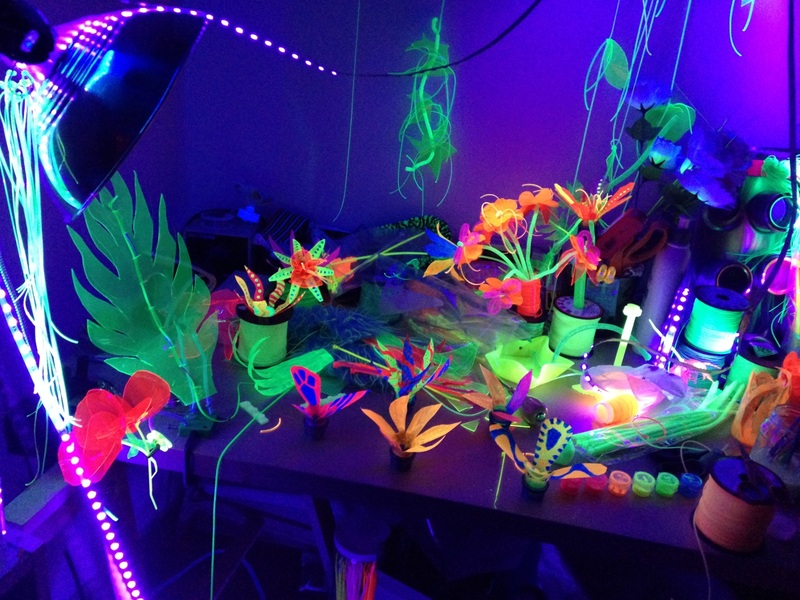 Fluorescent creations also glow beautifully in natural light, due to the presence of ultraviolet light. This workshop is very customizable, so please contact us if you'd like to book us for a party or event. You'll get 4 hours to explore with ultraviolet fluorescent crafting. We'll present you with a wide array of interesting, brightly-colored materials to experiment with. We'll set up our vinyl cutter and help you make designs that you can cut out of fluorescent materials. 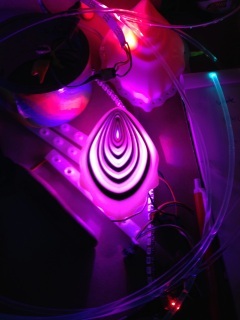 We'll also provide UV LEDs so you can make your creations glow at night on their own. We'll bring our laser cutter and help you design laser-cut parts/components out of fluorescent acrylic and fabric that you can integrate into your creation. 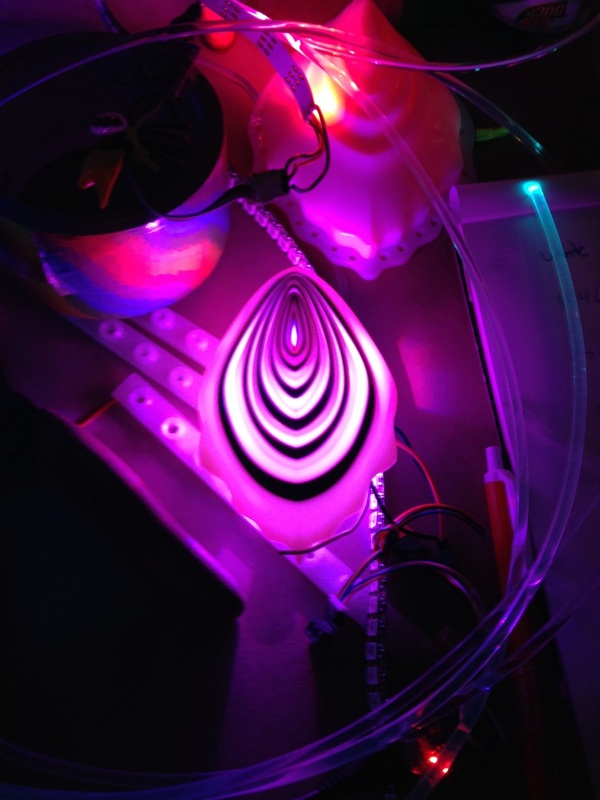 We'll also provide UV LEDs so you can make your creations glow at night on their own. With any option, we'll help you gently through the creative process. If you have an idea and aren't sure how to approach it, we can help you prototype something. Even if you don't have a concept to begin with, we have plenty of example pieces to study from. Just making the slightest variation can be enough to start imagining something entirely new. This is an excellent workshop to take with a few friends, or book for a private event. 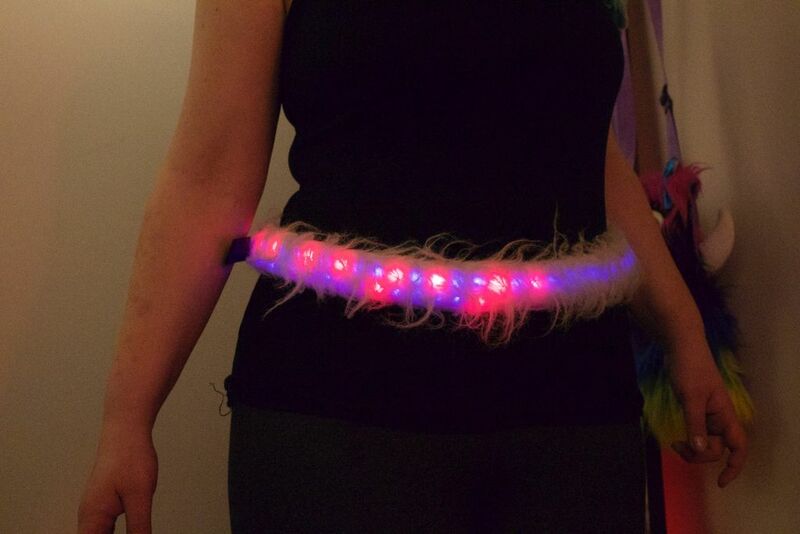 There's no denying, it adds a bit of magic and a lot of fun and style to add LEDs to your outfit, especially if you can program them to have cool patterns and respond to sound or other types of input. Not only is it awesome for you, but you get to make the people who see you have a nice time as well, as they oo and aahh over your blinky beauty. In this workshop we'll help you either add LEDs to existing clothing you have or create a new wearable accoutrement. We'll spend more time with you to help you design and build your own wearable project/idea. Customize your flower's colors and patterns by selecting from a variety of material options and styles. Solder LEDs, a sensor, and a hobby servo motor to an Arduino microcontroller. Program your Arduino to open and close and change the LEDs' colors based on sensor input. Depending on how quickly you progress, we'll also start to teach you how to program the flower with your own behaviors and different data inputs! Please talk to us if you'd like to build your own flower but are unable to attend our workshop in-person. We can mail you a kit with materials and helpful instructions, as well as do online video chat if you get stuck. Integrate a sensor into your project to bring your creation to life! We’ll have a few project options available, such as making a “techno-magic" wall-hanging or mandala.  Design your own futurist fashion accessories. Laser-cut materials including leather and acrylic. 3D-print custom components for artistic and functional use in your design. Integrate LEDs and fiber optics to make your accessory glow! This workshop is co-led by tech-fashion designer Mikaela Holmes. A boombox is a portable sound system. It's a concept that hasn't really evolved much over the decades. Sure, they've generally shrunk in size and sound better than they did, but they are a bit... Boring. Come on, this is the future! Let's create a boombox that's a feast for the eyes as well as the ears. What will you make? An instant nightclub in a box! Be the party. Impress your friends and make new ones! Our "coaches" have over 20 years' experience creating sound systems and lighting, and we'll help you through every step of the way, whatever your skill level. Additional parts and materials are available for purchase, if you want a bigger sound or more lights or lasers, etc. Sure, you can go to any bike store, get a few lights for basic safety and be done: basic headlight, red tail light. Safe, but boring. You can do better. We can help. In this 1-day, Level 2 workshop, you'll bling your bike for style AND functionality. Because at Burning Man, or wherever you find yourself in a sea of other bikes, yours better STAND OUT so you can find it and your friends can find YOU! Imagine your bike looks like it's about to travel through time in Back to the Future... But even better? It can change color and patterns depending on how fast your bike is going. Strobes on your wheels to make them look like they are going backwards? Possible! Add the "ahoy!" package and control your lights over Bluetooth so however crowded it gets at Opulent Temple you'll still get to the trash fence in time for Daft Punk! Don't Miss out! We will be adding more workshops, so please check back soon or join our email list to stay in the loop!